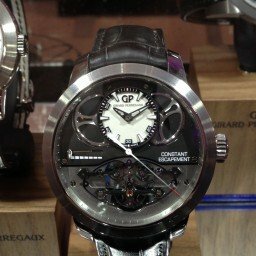 Girard-Perregaux’s (GP) Constant Escapement LM is a truly beautiful piece of Haute Horology, as I mentioned before I was lucky enough to try it on and have a hands-on experience of this wonderful watch whilst attending Salon QP. As I write this it has been another wondrous week for GP as they won the award for supreme distinction, the “Aiguille D’Or” at the Grand Prix d’Horlogerie de Geneve. Originally conceived to overcome the most troubling of issues with any watch movement powered by a mainspring coil (barrel) in which the mainspring loses energy over time. 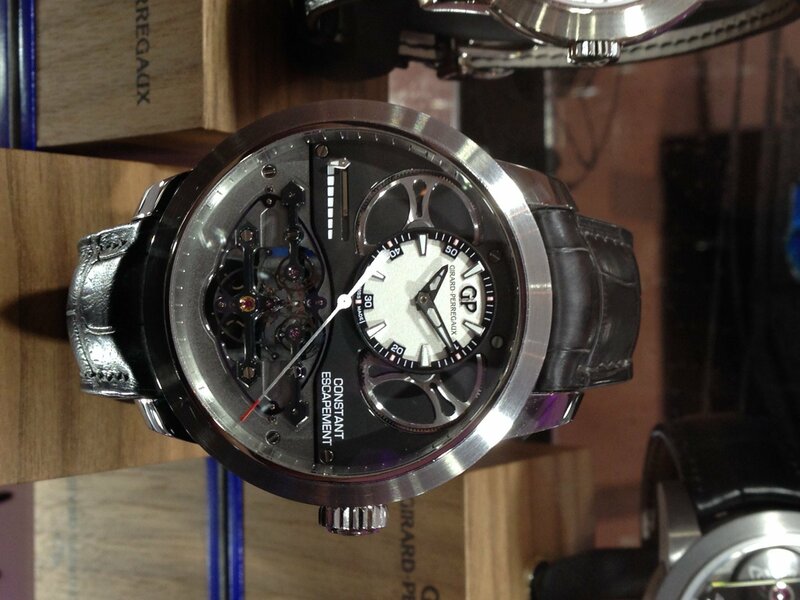 The Constant Escapement regulates the emitted power from the mainspring by an additional intermediary component. This blue silicon structure is seen very clearly in the bottom half of the watch, and if you look very closely it is actually the fine wire-like structure running across it in the middle horizontally that is the magical part of this whole system. It oscillates, back and forth as it is able to store energy it receives from the two main barrels in this watch until the moment it snaps back. As it has a certain threshold of force that will cause it to be in this state of flux, the power needed is Constant, i.e. it needs the same amount of energy from one side to cause it to “flip” back to the other side, and vice versa. So the amount of energy that is then released to the regulating organ is therefore also constant, meaning that the watch itself is able to run very accurately. This phenomenon of the silicon blade “flipping” back and forth is known as buckling, and you can see it happening in the video. Just to give you an idea of how precise this silicon blade is, it is 14 microns thick. Bearing in mind that one micron is one thousandth of a millimetre, so this structure is approximately one sixth of an average human hair. Below you can see the troubles (in a simplified format) experienced by a standard watch movement over time and then how the power curve is altered because of the Constant Escapement module. The watch itself is a rather large piece measuring at 48mm across in white gold on a black alligator strap, with its’ textured and almost sculptured dial layout and look it really looks and feels to me, a very special and unique piece. At Girard-Perregaux, they like the number three, as there appears to be a triplet of circles at the top of this watch which are the two barrels either side of the time subdial at 12 o’clock and also a triplet of bridges, a famous hallmark of GP, in the lower half of the piece. It is these three bridges that holds the regulating organ and its’ component parts in place. At the 9 o’clock position there is a small linear power reserve indication and at 3 o’clock the immortal words, Constant Escapement. For a watch that has this much technical innovation, it is still only 14.63 mm thick and at first glance looks like a large sports watch, but a sports watch it is not. A special watch is all it will ever need to be with such a ground breaking piece of innovation, and a design DNA that is 100% Girard-Perregaux. I would like to thank my contacts at Girard-Perregaux for their help and resources that have made this article possible.